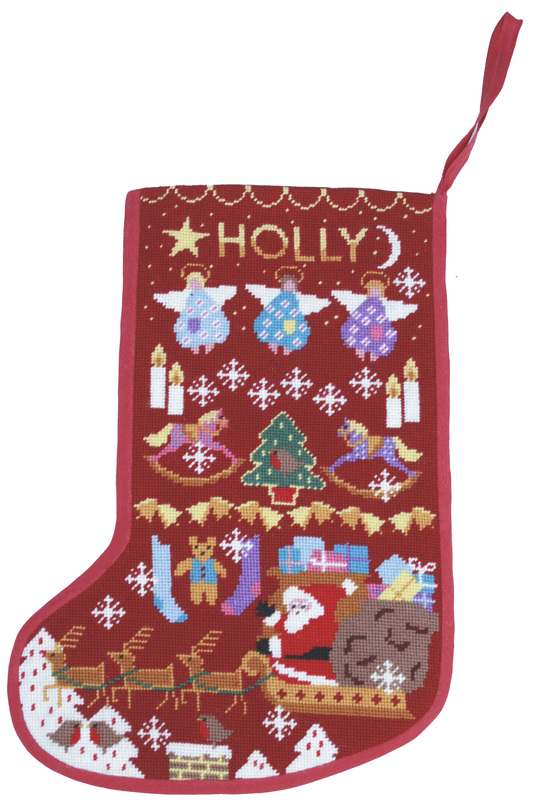 New designs – Christmas Stocking Tapestry kits. Somehow this year, I endeavoured to choose colours for my new designs that promptly went right out of stock with my wool suppliers. Now they tell me that most of my missing colours have arrived and are on their way to me. So, a bit late, here is the new range for 2011! First, Christmas Stockings for Children – not for them to stitch, but for you to stitch for them! This is Starry Stocking. One design, three colourways, with Santa bustling about, scattering presents and stars everywhere. Just click on the following links for a closer look. for a little girl when nothing but pink will do. to conjure up the magic of Christmas for just about anyone. Then there is Red Stocking. A sparkling, magical stocking, packed as full as Santa’s sack with Christmas goodies. Angels and bells, Rudolf and robins, stars and snowflakes. I have more new designs on the way, but that is another post. This entry was posted in Blog by Wendy. Bookmark the permalink.